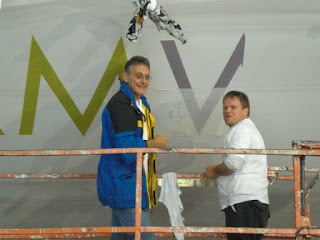 Josef from airborne grafix busy with removing Stella Artois and putting the new brands on the airship. I've been following this blog with interest, as I'm a long-standing LTA fan, and look forward to seeing her in the US. 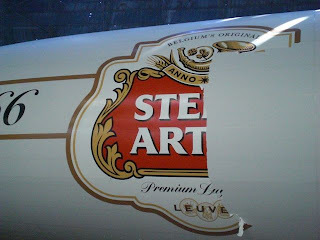 Just a question about 'rebranding' the ship with decals; what is the process for removing and attaching new decals to the envelop; are solvents or adhesives used, and if so, do they reduce the longevity of the envelop?